Sidney Albert Brown was a splendid attacking three-quarter, who normally played on the wing. He was born in Broughton, Salford, Manchester, in 1897, the son of a cabinet maker. His family moved south to Birmingham soon after Sid was born, and then on to Gloucester by 1901, when they were living at 2, Cecil Road. By 1911 they had moved to 39, Clegram Road, Gloucester. Sid made his mark as a schoolboy rugby player, and was capped by England at this level. Sid served with the 7/Gloucesters during World War One, but returned home safely, and his career with Gloucester started as soon as rugby resumed at Kingsholm after the war. Sid’s first game for the Club was on 20th September 1919 at Kingsholm against Abertillery – and Sid made an immediate impact with two tries in a 13-0 win. He backed this up with another brace of tries in the next match, won 21-6 against Cheltenham. Further tries against Moseley, Newport, Cardiff, Stroud and Cheltenham again, resulted in Sid having a return of 9 tries from 15 appearances in his first season with Gloucester. 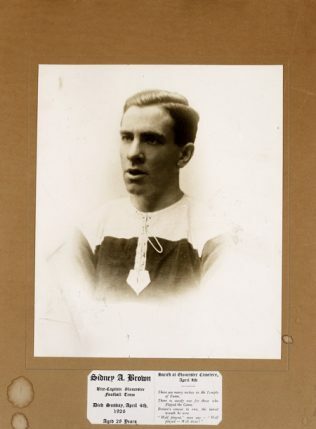 Sid started the 1920-21 season in similarly impressive form, with two tries against Lydney in the first match, and ended it with 20 tries from his 25 appearances, which made him the leading try-scorer for the Club. In October he contributed Gloucester’s only try in a 5-0 win over Cinderford, and the following week scored all of Gloucester’s points with 2 tries in a 6-3 win over Bristol. Cheltenham again suffered at his hands to the extent of 3 tries as Gloucester completed the double over them, and he scored 4 tries in a single match against Moseley. This season was perhaps most notable for wins against all of the big 4 Welsh clubs – Swansea, Newport, Cardiff and Llanelly – only the second time this feat had been achieved. 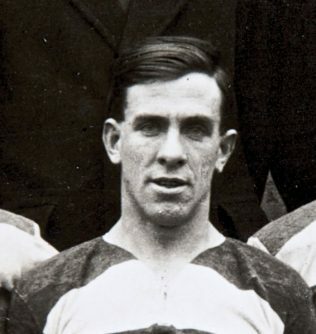 Sid made his usual bright start to the season in the 1921-22 season, with a try in the first match against Lydney, and later that September he not only scored a try in the 24-8 win away at Northampton but also kicked a drop goal, which turned out to be the only points he ever scored with a kick in his whole career for Gloucester. He also scored hattricks of tries in the 40-6 victory over Clifton, and rather more crucially in the 14-13 win over Headingley. He ended the season with 12 tries from 24 appearances, but Norman Daniell took over his mantle as the Club’s leading try scorer. He kicked off the 1922-23 season in more muted form, scoring only 2 tries in the first two months of the season, but Cheltenham whetted his appetite again, and the visit there on 4th November resulted in a hattrick of tries for Sid. He scored a lot of tries in pairs this season – against Old Merchant Taylors on Boxing Day, Old Blues, Cinderford, Clifton, and at Sidmouth on the end-of-season tour to Devon. A try in the final match against Cross Keys brought his total for the season to 22 tries from 35 appearances, out of the 43 matches played by the Club, and restored his position as Gloucester’s leading try scorer. Sid was back to his usual form at the start of the 1923-24 season, with a try in the first match against Lydney, and followed it with a try at Northampton, which allowed Gloucester to sneak away with a 3-0 win, described as “a strenuous game, in which Gloucester were lucky to win”. He scored two tries against OxfordUniversity, but in vain as Oxford romped home 28-11 in a “brilliant game, Oxford’s superior pace behind being the deciding factor”. He scored again in the Boxing Day match, won 9-8 in the last minute against Old Merchant Taylors. Four tries against United Services, and two each against Old Blues and Lydney, helped to boost his season’s total to 18 from 31 appearances (out of Gloucester’s 39 fixtures); he was again the Club’s leading try scorer. Sid found tries a little harder to come by in 1924-25, although he did score 2 in the 21-0 defeat of Bath, and another 2 in the 8-0 win over Newport. Towards the end of the season in April, he scored a hattrick as Gloucester brushed London Welsh aside 40-8, and also ran in tries against Plymouth Albion and Sidmouth on the end-of-season tour. This gave him a total of 14 tries from 29 appearances in the Club’s 40 fixtures. On 13th November 1924, Sid played in the Club’s 50th Jubilee Match against a team brought to Kingsholm by the then President of the RFU; the result was Gloucester 11 Capt Donne’s XV 9, with the home side snatching the win with a score right on full-time. This season also saw Sid switch his county allegiance to Gloucestershire, having previously been capped at this level by his native county, Lancashire. He was thrown in at the deep end, his first match for Gloucestershire being against the All Blacks at Kingsholm on 25th September 1924. Although New Zealand won 6-0, this was a very creditable performance by Gloucestershire against a touring team which won all 30 of its matches, scoring 721 points against 112. He played in all of Gloucestershire’s subsequent games that season, when wins against Devon (2 tries scored by Sid), Somerset, Cornwall and Middlesex saw them through to the County Championship Final, which they lost 6-14 to Leicestershire. The first 3 games of the 1925-26 season were won by Gloucester, with Sid contributing a try in each, against Stroud, Lydney and Old Edwardians. Cheltenham had their usual difficulty in handling Sid, and he scored 4 tries in the 19-5 away win. He scored an important try to help Gloucester sneak home 15-14 against Swansea, and another two on Boxing Day against Old Merchant Taylors, before running in a hattrick against Old Blues. In March 1926, Sid hit a rich vein of form, scoring against Newport, the Royal Air Force and Bath (twice) in successive games. The tries against Bath on 20th March, in a 17-3 victory, were to be his last. In the next match against Aberavon at Kingsholm on Easter Saturday, 3rd April, Sid was injured. He was taken to the Gloucester Royal Infirmary, where he died the following day. The Aberavon match was Sid’s 26th appearance of the season, out of 32 fixtures played up to that date. He had already scored 21 tries, the highest try scoring ratio of any season in his playing career. His career statistics for Gloucester totalled 185 appearances, 116 tries, and one drop goal. The Club and the City were devastated by the news of Sid’s death. He was a popular player with both supporters and players, who had elected him vice-captain. This led to him frequently captaining the side when Tom Voyce was away on representative duties or injured. The rest of the Easter programme of matches against London Welsh and Cinderford was cancelled, as was the following Saturday’s match against Moseley. The sympathy of rugby followers was aroused over a wide area. This was demonstrated in a practical way in a magnificent response to an appeal which was raised by Bill Bailey, the rugby correspondent of the Citizen, on behalf of Sid’s widow and young son. Subscriptions poured in from all over the country, as well as America and Bermuda, and the appeal finally reached the grand total of £1,645 7s 11d, which was invested on behalf of the bereaved dependents. Some of the money was used to bring up and educate Sid’s son, but his widow remarried and was thereby disqualified from benefitting. The trustees (Dr A Alcock, and Messrs Arthur Fielding, George Bland, W T Pearce and J Brookes) wound up the fund in 1946, and the residue of about £1,000 was paid to Sid’s son who by then had reached the age of 21. The circumstances of the sad death of Sidney Albert Brown (28) the vice-captain of Gloucester Football Club, which occurred at the Royal Infirmary on Sunday morning following injuries he sustained the previous day at Kingsholm in the Gloucester v Aberavon match, were inquired into by the City Coroner (Mr. G.Trevor Wellington) on Thursday afternoon. The inquest was held in the boardroom of the Institution, and the Coroner sat without a jury. The Gloucester Football Club were represented by Messrs J.T.Brookes (a vice president of the Club), Arthur Hudson (Secretary), A.T.Voyce (Captain), T.Millington and F.W.Ayliffe. Albert Brown (Coachbuilder’s Foreman), 29 Bloomfield Road, Gloucester, vice-chairman of the Gloucester Club Committee, gave evidence of identifying the body as that of his son, whose home was at Woodside House, Primrose Hill, Lydney, and who resided with witness during mid week. His son had played Rugby Football from boyhood, having gained a school’s international cap and caps for Lancashire and Gloucestershire counties. On Saturday he was playing for the Gloucester Club against Aberavon at Kingsholm. He was then in his usual good health. Witness was sitting inside the ropes. Towards the end of the game witness saw his son make a splendid tackle of an opponent. Both players fell to the ground and witness saw his son lying on his right side and thought something was amiss. Ambulance men attended his son and Dr John Greene also came to him. Dr Greene said he had a bruised rib. After a few minutes his son resumed play, which went on for about eight minutes until “no side” sounded. Witness walked home with his son and there seemed to be little amiss with him then. Later his son walked to Dr Greene’s house in Stroud Road, and after examining him Dr Greene drove him and his son to the infirmary, calling for witness on the way. Witness remained at the infirmary with his son until 8.45pm when he seemed to be in great pain. Dr Knight said there was kidney trouble. Next morning between six and seven witness was told his son had been operated upon and went to the infirmary. As far as witness knew his son did not regain consciousness after the operation and he died about 7.30am. The coroner (to Mr. Brown): You are quite satisfied it was a pure accident and that there was no question of foul play? Mr. Brown: I am quite satisfied it was a pure accident. What you have told me about the accident is borne out by Mr. Millington and Mr. Ayliffe who played in the match – Yes there is no controversy. Dr.C.V.Knight, senior surgeon to the Royal Infirmary, said he saw the deceased at 7pm on Saturday at the Institution and witness diagnosed a rupture of the kidney. He thought at the time an operation was not desirable, and after a consultation with Dr.R.L.Haines at 8.15pm, he was confirmed in that opinion. Brown’s pulse rate was then falling, and witness gave instructions that he was to be carefully watched, and if there was any change witness was to be called at once. At 6am on Sunday witness received a message and on arriving at the Infirmary a quarter hour later he found Brown in a desperate condition. Brown was removed to the operating theatre where, with the assistance of Dr.C.Newlyn Smith and Dr.H.P.Goldsmith, he removed a ruptured kidney. There was evidence of extensive haemorrhage, which must have come on suddenly. Witness had ascertained that deceased was watched very carefully all through the night. Death was due to haemorrhage and shock following a ruptured kidney, which might have been sustained in tackling an opponent. Replying to Mr. Brown, Dr.Knight said his son did not regain consciousness after the operation. The coroner: Here is a man who meets with this injury, finishes the game, changes, walks to his home, walks to the surgery and several hours afterwards is showing an improving pulse rate. This haemorrhage must have been very sudden. Dr.Knight: It is what we call delayed haemorrhage. A ruptured kidney is not uncommon, and unless there is some sign of severe haemorrhage we do not operate. The majority go on without any interference at all. The coroner said he did not consider it necessary to call any further evidence, and he recorded a verdict that death was due to haemorrhage and shock following a ruptured kidney. Proceeding the Coroner said it was peculiarly distressing that for the second time in just over a year he should have to hold an inquest “upon one of our own players.” Knowing Mr Brown senior, his family and Sidney as he did, and taking such an interest in him in connection with the club, he was deeply sorry at this happening. The family would have the sympathy of every decent sportsman and he (the Coroner) could only offer his own heartfelt sympathy. Mr. Brookes speaking on behalf of the Club, said that all deplored the passing of Sidney Brown. He was the Club’s vice captain, and they not only admired him for his play and as a sportsman, but also for the manly qualities he displayed in life. He had been a valued member of the Club for many years. He had served on the Committee and had earned the highest respect and regard of all those with whom he came into contact. He (Mr. Brookes) desired to offer their sincere sympathy to Mr. Brown senior, the widow, and all who suffered with them in their bereavement. It might help the family to know that this was shared by all the Gloucester players and all those who knew Sidney Brown. Mr. T.D.Griffiths, the Secretary of the Aberavon Club, would have been present at the inquiry but he did not know the actual time and Mr. Griffiths desired him to express on behalf of the Aberavon Club how much they regretted that they had taken part in a game which meant the death of Sidney Brown. Mr. Brown said that on behalf of the family he deeply appreciated the tribute that had been paid to his son.